Paul Pogba tried to bury the hatchet with Jose Mourinho after Manchester United romped to victory in their first game since he was sacked. 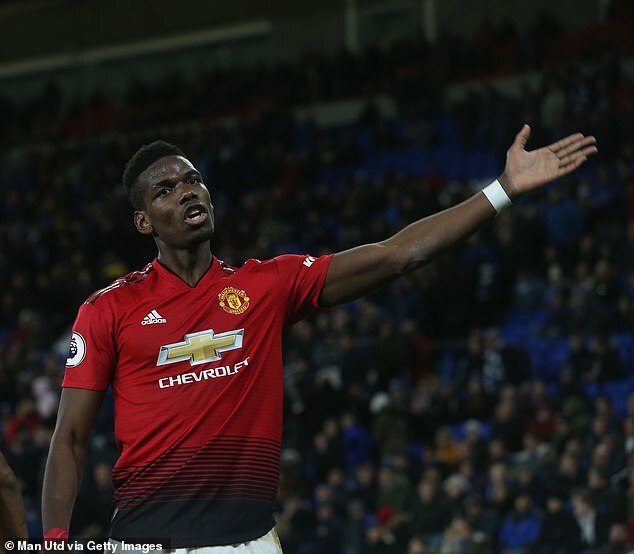 Pogba was involved in four goals as United won 5-1 at Cardiff under interim boss Ole Gunnar Solskjaer – the first time they have scored five in the Premier League since Sir Alex Ferguson’s last game in charge in 2013. The Frenchman’s relationship with Mourinho turned toxic as he was stripped of the vice-captaincy and benched for the manager’s final three league games. Pogba added fuel to the fire by posting a picture of himself smirking on social media shortly after Mourinho was axed on Tuesday. However, the 25-year-old midfielder attempted to smooth over their fall-out by publicly thanking Mourinho for making him a better person and player. Pogba admitted that ‘not everything went well’ with the Portuguese coach, but pointed out that Mourinho won three trophies in his first season. ‘I know you’re waiting for something about Jose or about the result,’ he told reporters after United’s win in Cardiff. ‘Obviously, we’re really happy about the result. We played well and the performance of the team was great. ‘I know you want to ask, “oh yeah, but with Jose…” With Jose, we won trophies. We worked. I want to thank him for that. ‘Not everything went well, but things went well. We won trophies. He made me improve, as a person as well. That’s it. That’s the past. I want to thank him for that. I’m sure all the players do. ‘Now we’re looking at the next game, for the points we need. We want to go back to the top of the league. The performance was great. Pogba’s former teammate Wayne Rooney admitted that it was the right decision by Old Trafford chief Ed Woodward to sack Mourinho and install Solskjaer after the relationship between the coaching team and the players turned sour. Speaking as a pundit for BT Sport, Rooney said: ‘Something had to change. It was the right decision. ‘I stay in touch with a lot of people at the club. I speak to them quite a lot. To be a successful club you need to have everything right. That relationship between some of the staff and players wasn’t great. Bringing in Ole and Mick (Phelan) will change things. ‘Not just the players, the whole football club. I’m sure Ed Woodward was the same, the staff, the kitchen ladies, the kit men, they weren’t enjoying it.